Calor, a leading provider of liquified natural gas (LNG) in the UK, has further enhanced its refuelling network for natural gas-powered trucks by upgrading its Aust LNG facility, near Bristol. It is a vital refuelling stop for LNG-fuelled vehicles using the M4 corridor to travel to London or elsewhere in the UK. Part of Moto’s Severn View Services, the Aust facility is located off the M48 motorway by the Severn River Crossing. It has been upgraded to consider the requirements of mono-fuelled trucks. The new system uses ‘zero loss’ cooling technology to keep LNG within the storage tank at the ideal temperature and pressure for refuelling vehicles. 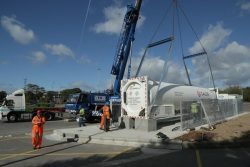 Similar work has been carried out at Moto’s Donington Park, Lymm and Grantham service stations, to add to Calor’s growing LNG infrastructure of six public refuelling facilities. Keeping LNG in this optimum state reduces the likelihood that warm gases such as methane need to be vented from the vehicle’s onboard storage tank during refuelling. Venting can result in increased emissions and prolonged refuelling times. Thanks to the ‘zero loss’ technology, if venting is still required all vent gases are captured in the LNG station with no losses to atmosphere. 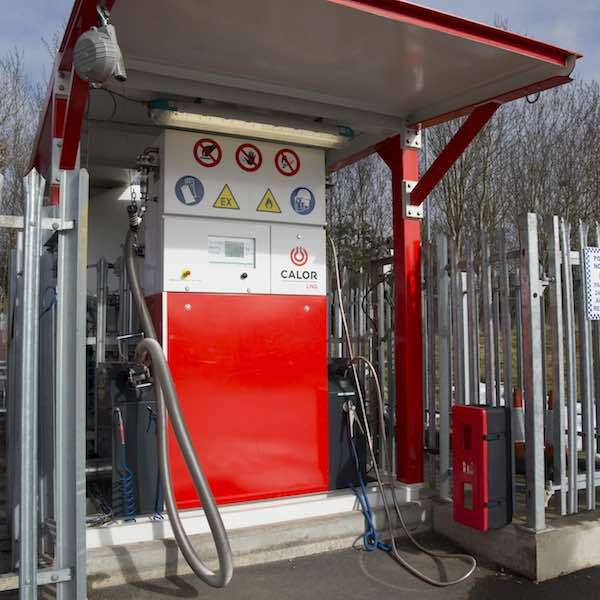 As demand for LNG continues to grow in the haulage industry, especially for long-haul vehicles, Calor continues to invest in its LNG refuelling network, which is the largest in the UK. Unlike conventional fuels such as diesel, LNG emits significantly less CO2 and dramatically reduces dangerous particulates such as NOx and SOx. The fuel is colourless and odourless, and is created by cooling natural gas to around -162°C. At this temperature the gas liquifies and reduces in volume, making it ideal to fuel regional and long-haul heavy goods vehicles (HGVs), as larger quantities can be stored. Furthermore, LNG-powered trucks are far quieter than their diesel-fuelled equivalents, meaning they can operate longer in areas subject to noise restrictions. This is invaluable for HGVs that deliver to supermarkets near residential areas, or city centres that impose regulations on traffic and noise levels. Mark Gilks, Transport Specialist at Calor, adds: “Leading truck manufacturers are predicting that, by the early 2020s, vehicles powered by natural gas could account for 20 per cent of all HGVs sold. This growing market share highlights the obvious benefits of choosing LNG to power long-haul HGVs now and into the future.